Among the media, academia and within planning circles, there’s a generally standing answer to the question of what cities are the best, the most progressive and best role models for small and mid-sized cities. 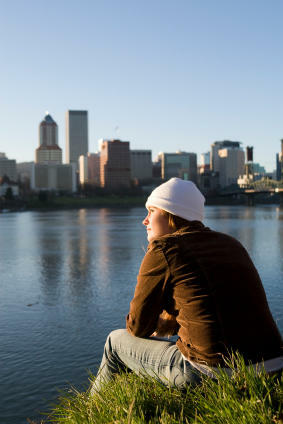 The standard list includes Portland, Seattle, Austin, Minneapolis, and Denver. In particular, Portland is held up as a paradigm, with its urban growth boundary, extensive transit system, excellent cycling culture, and a pro-density policy. These cities are frequently contrasted with those of the Rust Belt and South, which are found wanting, often even by locals, as “cool” urban places. But look closely at these exemplars and a curious fact emerges. If you take away the dominant Tier One cities like New York, Chicago and Los Angeles you will find that the “progressive” cities aren’t red or blue, but another color entirely: white. 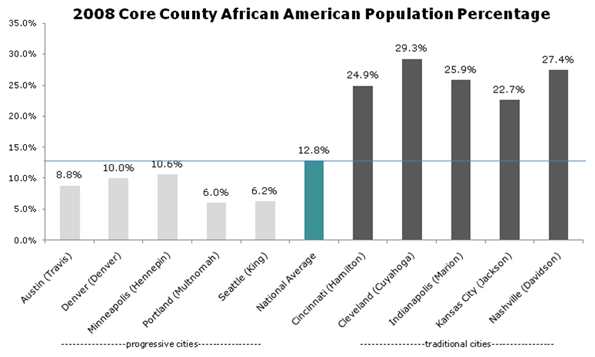 In fact, not one of these “progressive” cities even reaches the national average for African American percentage population in its core county. Perhaps not progressiveness but whiteness is the defining characteristic of the group. The progressive paragon of Portland is the whitest on the list, with an African American population less than half the national average. It is America's ultimate White City. The contrast with other, supposedly less advanced cities is stark. It is not just a regional thing, either. Even look just within the state of Texas, where Austin is held up as a bastion of right thinking urbanism next to sprawlvilles like Dallas-Ft. Worth and Houston. 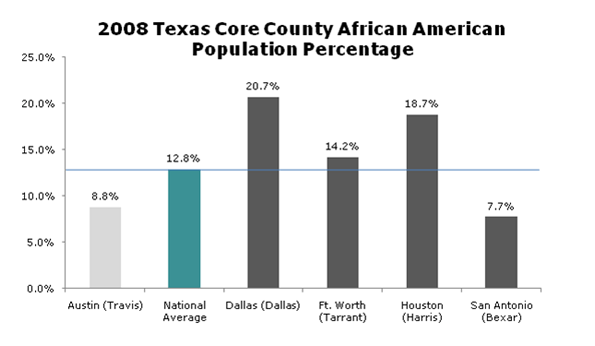 Again, we see that Austin is far whiter than either Dallas-Ft. Worth or Houston. This raises troubling questions about these cities. Why is it that progressivism in smaller metros is so often associated with low numbers of African Americans? Can you have a progressive city properly so-called with only a disproportionate handful of African Americans in it? In addition, why has no one called these cities on it? As the college educated flock to these progressive El Dorados, many factors are cited as reasons: transit systems, density, bike lanes, walkable communities, robust art and cultural scenes. But another way to look at it is simply as White Flight writ large. Why move to the suburbs of your stodgy Midwest city to escape African Americans and get criticized for it when you can move to Portland and actually be praised as progressive, urban and hip? Many of the policies of Portland are not that dissimilar from those of upscale suburbs in their effects. Urban growth boundaries and other mechanisms raise land prices and render housing less affordable exactly the same as large lot zoning and building codes that mandate brick and other expensive materials do. They both contribute to reducing housing affordability for historically disadvantaged communities. Just like the most exclusive suburbs. This lack of racial diversity helps explain why urban boosters focus increasingly on international immigration as a diversity measure. Minneapolis, Portland and Austin do have more foreign born than African Americans, and do better than Rust Belt cities on that metric, but that's a low hurdle to jump. They lack the diversity of a Miami, Houston, Los Angeles or a host of other unheralded towns from the Texas border to Las Vegas and Orlando. 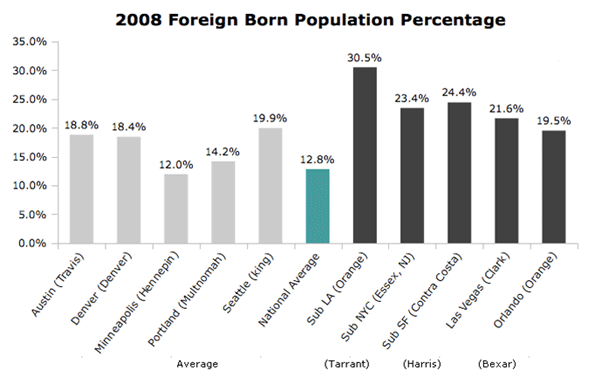 They even have far fewer foreign born residents than many suburban counties of America's major cities. The relative lack of diversity in places like Portland raises some tough questions the perennially PC urban boosters might not want to answer. For example, how can a city define itself as diverse or progressive while lacking in African Americans, the traditional sine qua non of diversity, and often in immigrants as well? Imagine a large corporation with a workforce whose African American percentage far lagged its industry peers, sans any apparent concern, and without a credible action plan to remediate it. Would such a corporation be viewed as a progressive firm and employer? The answer is obvious. Yet the same situation in major cities yields a different answer. Curious. In fact, lack of ethnic diversity may have much to do with what allows these places to be “progressive”. It's easy to have Scandinavian policies if you have Scandinavian demographics. Minneapolis-St. Paul, of course, is notable in its Scandinavian heritage; Seattle and Portland received much of their initial migrants from the northern tier of America, which has always been heavily Germanic and Scandinavian. In comparison to the great cities of the Rust Belt, the Northeast, California and Texas, these cities have relatively homogenous populations. Lack of diversity in culture makes it far easier to implement “progressive” policies that cater to populations with similar values; much the same can be seen in such celebrated urban model cultures in the Netherlands and Scandinavia. Their relative wealth also leads to a natural adoption of the default strategy of the upscale suburb: the nicest stuff for the people with the most money. It is much more difficult when you have more racially and economically diverse populations with different needs, interests, and desires to reconcile. In contrast, the starker part of racial history in America has been one of the defining elements of the history of the cities of the Northeast, Midwest, and South. Slavery and Jim Crow led to the Great Migration to the industrial North, which broke the old ethnic machine urban consensus there. Civil rights struggles, fair housing, affirmative action, school integration and busing, riots, red lining, block busting, public housing, the emergence of black political leaders – especially mayors – prompted white flight and the associated disinvestment, leading to the decline of urban schools and neighborhoods. There's a long, depressing history here. In Texas, California, and south Florida a somewhat similar, if less stark, pattern has occurred with largely Latino immigration. This can be seen in the evolution of Miami, Los Angeles, and increasingly Houston, San Antonio and Dallas. Just like African-Americans, Latino immigrants also are disproportionately poor and often have different site priorities and sensibilities than upscale whites. This may explain why most of the smaller cities of the Midwest and South have not proven amenable to replicating the policies of Portland. Most Midwest advocates of, for example, rail transit, have tried to simply transplant the Portland solution to their city without thinking about the local context in terms of system goals and design, and how to sell it. Civic leaders in city after city duly make their pilgrimage to Denver or Portland to check out shiny new transit systems, but the resulting videos of smiling yuppies and happy hipsters are not likely to impress anyone over at the local NAACP or in the barrios. We are seeing this script played out in Cincinnati presently, where an odd coalition of African Americans and anti-tax Republicans has formed to try to stop a streetcar system. Streetcar advocates imported Portland's solution and arguments to Cincinnati without thinking hard enough to make the case for how it would benefit the whole community. That's not to let these other cities off the hook. Most of them have let their urban cores decay. Almost without exception, they have done nothing to engage with their African American populations. If people really believe what they say about diversity being a source of strength, why not act like it? I believe that cities that start taking their African American and other minority communities seriously, seeing them as a pillar of civic growth, will reap big dividends and distinguish themselves in the marketplace. This trail has been blazed not by the “progressive” paragons but by places like Atlanta, Dallas and Houston. Atlanta, long known as one of America's premier African American cities, has boomed to become the capital of the New South. It should come as no surprise that good for African Americans has meant good for whites too. Similarly, Houston took in tens of thousands of mostly poor and overwhelmingly African American refugees from Hurricane Katrina. Houston, a booming metro and emerging world city, rolled out the welcome mat for them – and for Latinos, Asians and other newcomers. They see these people as possessing talent worth having. This history and resulting political dynamic could not be more different from what happened in Portland and its “progressive” brethren. These cities have never been black, and may never be predominately Latino. Perhaps they cannot be blamed for this but they certainly should not be self-congratulatory about it or feel superior about the urban policies a lack of diversity has enabled. Submitted by sagrudas on Tue, 09/21/2010 - 07:52. The notion that African Americans are the only cause of diversity in a city is a little silly. There are so many ways to be 'diverse' and race is just one of them. This author didn't even consider that their might be economic reasons for the lack of other races in Portland, or just a lack of real reason for moving there. Did the content writer even acknowledge that Portland hasn't exactly been a major historical center for black people in America?